Eggs are elongated, very small, about 0.25 mm, and are clear or milky white in color. The red eyes of the embryo are seen through the shell before hatching. Eggs are laid inside the plant tissues. Incubation takes about 4-7 days. Nymphs are small, wingless, teardrop-shaped and yellow-orange to brown in color. Nymphs pass through five instars before becoming adult. With each molt, the young closely resemble the adults they will eventually become. The nymphal stage takes about 2 weeks. Adults are also very tiny, about 2 mm long, ovate, and black with white wing patches. Their head and thorax are shiny and black, and their beak extends to between the bases of the first pair of legs. They have flattened bodies that are colored black or brown with lighter markings like pirate flags, hence the name. They possess efficient searching behavior and are voracious general feeders. They are able to aggregate in areas of high prey density and increase their numbers rapidly where food is abundant. They can consume 30 or more spider mites per day. 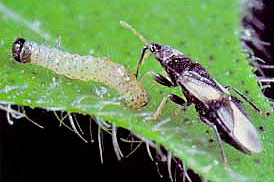 Both nymphs and adults feed on a variety of pests as their primary source of food. Their lifecycle takes about 20 days under optimum conditions to complete. Adults live for about 3 - 4 weeks. Minute pirate bugs are commonly found where there are flowering shrubs and weeds. These insects are also found in corn, peanut, peas, cotton, soybeans, alfalfa, strawberries, and grapes. When they are in corn silks, they eat the corn earworm eggs and other small insects found on the silks. Insecticide applications to crops can greatly reduce their numbers.